Maybe the following information is more suited for Halloween than Thanksgiving but it’s still fun to report even if it is a month late! 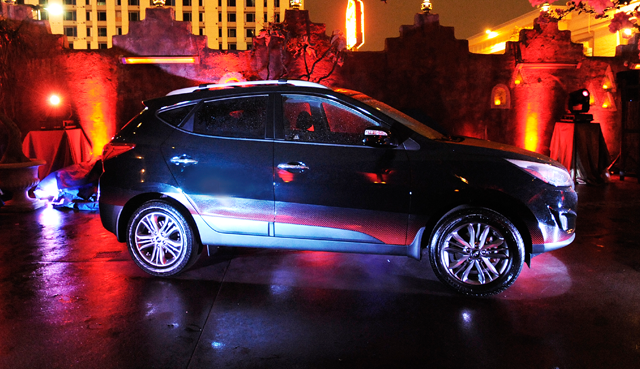 Last week, Hyundai revealed a Special Edition Hyundai Tucson inspired by The Walking Dead. The SUV is collaboration between Hyundai and Robert Kirkman, author and creator of The Walking Dead novel series which will be celebrating its tenth anniversary next year. As part of that celebration Hyundai and Kirkman have so far created three Hyundai Zombie Survival Machines and The Walking Dead Chop Shop configurator app, which allows fans to design their own custom zombie survival machines. Hyundai says the SUV “features an Ash Black exterior with a subtle red accent graphics package and Special Edition exterior and interior badges. Roof rack cross rails provide additional room for hauling necessary survival gear while mudguards and custom floor and cargo mats help keep the vehicle clean. The vehicle will be offered only in AWD to assist drivers when off-roading away from the undead. Within the Tucson’s black leather interior, passengers will find a custom Zombie Survival Kit – a Walking Dead 72-hour survivalist’s backpack, a necessary item for any zombie “prepper” – and a Walking Dead Tucson Quick Reference Guide, to help utilize all the features in the Special Edition vehicle. In addition, for true enthusiasts of The Walking Dead, this Tucson will offer vehicle decals for the four factions featured in the series: Hilltop, Kingdom, Saviors, and Survivors, so owners can proudly display where their allegiances lie.” The really cool part? You can own one! The all-new production model Tucson will be available in limited quantity at dealerships starting early next year!